Have you ever had a burger that tasted good enough to… walk on? My guess is that even if it did taste like something you wouldn’t mind putting your feet in, the burger’s design doesn’t exactly call for an edible walking solution. But this design, on the other hand, might just be optimal for running track, and then grabbing a quick snack after your exercise just by chewing on your shoe. The Nike (Burger) Air Max 90, commissioned by Nike for design by Ole Hemmendorff and 7 other creative minds, is a shoe which might prove to be the tastiest footwear ever created. Hemmendorff claims that the shoe is designed with hamburger because the meat is “the most powerful, must durable and most delicious material known to man.” Now that’s a man who loves his beef. 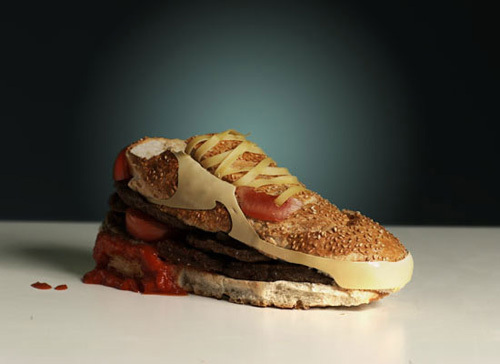 Even if you’re not necessarily a sport enthusiast, the Nike Burger would serve as a great tool for the laziest of those among us. You can be sitting on the couch, your brand new kicks propped up on the chair, and the burger smell might just be insatiable. Actually, now that I think about it, these sneakers probably won’t last very long. The Nike Burger sneakers will be on display at Sneakers ‘N’ Stuff in Stockholm for the next two months if you want a chance to check out these shoes for yourself. While they probably won’t let you slip your feet inside and walk around, at least you can take a see them for yourself. Anyway, seeing is believing.